Gardiner Comfort in The Elephant in Every Room I Enter. BOTTOM LINE: Gardiner Comfort delivers a one-man show about his life with Tourette Syndrome. Like any savvy storyteller, Gardiner Comfort reaches his audience not by asking them to dispel their stereotypes toward Tourette Syndrome but instead by sharing with them his earnest and often comical anecdotes associated with his condition. All the more impressive is that Comfort presents this via his one-man show The Elephant in Every Room I Enter that he also co-created (alongside director Kel Haney). Most meaningful still is the fact that La MaMa Experimental Theatre Club is opening up dialogue surrounding this often misunderstood syndrome and how Comfort takes this opportunity and runs with it. Comfort was diagnosed with Tourette Syndrome when he was seven years old, and much of the play chronicles his experiences at the 1st World Congress on Tourette Syndrome and Tic Disorders, held this past June in Washington, DC. Comfort plays various characters he meets over the five-day conference, from a flamboyant young actor to a Southern father accompanying his son to DC. Comfort further shows off his versatility by demonstrating a cacophony of the Tourette individualities that he saw at the conference, ranging from echolalia to bear hugging. While it was educational to see the various forms Tourette Syndrome can take, it’s possible Comfort presented too many characters for any of them to viscerally stick with the audience. By the show’s end, Comfort is the person we care for—the multitude of other conference attendees seem too underdeveloped to warrant emotional investment. Still Comfort makes an effort to circle back to characters he mentions earlier in the show, and the play’s linear timeline helps keep characters and events in order. In between conference days, Daisy Long’s exquisite lighting design shows the passing of time, coupled with Caite Hevner Kemp and Lianne Arnold’s wondrous projections. But it is when Comfort breaks the linear format that his show becomes most interesting and, well, theatrical. While playing improvisational games with some young members at the conference, Comfort shares one skit where two participants played a Harvard admissions officer and a hopeful college attendee. When the attendee’s Tourette Syndrome acted up, the child playing the admissions officer asked, “Why can’t you stop your tic?” Comfort then spirals out to the audience to show how he responds to that question, which as the title suggests is something he copes with more often than one should. He reenacts a subway episode where a rider offers him a lozenge for his cough tic, and how Comfort has to constantly remind others that his syndrome is neurological, not influenzal. Moments like this, where time and space are jostled in order to show Comfort’s more personal experiences, show lovely theatricality, and more of these would have unleashed the story’s potential. The Elephant in Every Room I Enter mostly focuses on Comfort’s experience at the conference, but he does discuss his formative childhood. Growing up in New York City, he was surrounded by his mother’s artistic delights which included dancers and performers who offered a young Comfort where he might invest all his future ideas and passions. 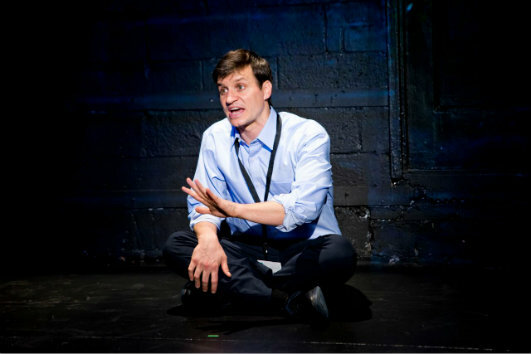 Comfort shows an infantile dance he would do to simultaneously focus and distract his mind, a dance he later magnifies and texturizes during the play’s climactic ending. Comfort, bounding around the stage and releasing ripples of color that synced with his movement, getting lost in the blur of his anxieties and hopes, seemed beautifully at home.